Jesse recently bent his rear axle, so while his bike was down, I seized the opportunity to push single speeding on him. I lent him my On One Inbred, a rigid (no suspension) steel framed single speed with 32×16 gearing. 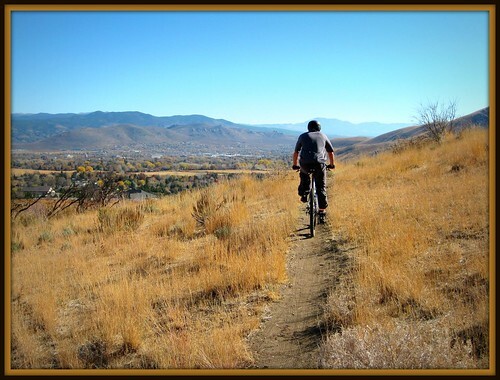 Until someone has given single speed mountain biking a shot, you may get comments from them like, “I don’t get it…” or “Why not just stay in one gear on your geared bike?“. Most are valid questions, since it seems counter intuitive to give up suspension and 27 gears! After the ride, I gave Jesse a few questions to get a feel for his single speed experience. Bike Carson: What were your thoughts about single speeds before you tried one? Jesse: Before I tried riding a single speed bicycle I had high anxiety. I was afraid it was going to be slow on the level ground, and then that I would have to sweat through laborious climbs. The fact that this particular bike has no suspension also made me nervous about descending the trails, especially on the rough and rocky portions. 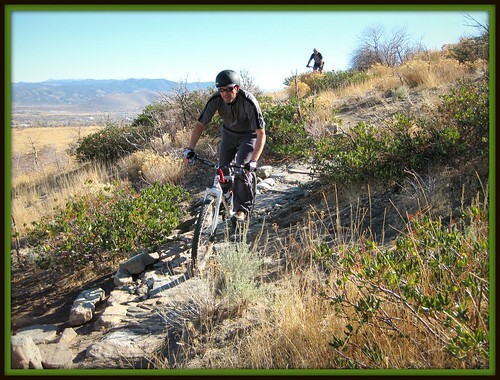 Bike Carson: What were your first impressions once out on the trail? Jesse: Once I hit the trail, the first thing I noticed was that I was very in control of my breathing. The climb was more of a muscle game rather than a cardio workout. My spinning was slower than on a traditional geared mountain bike in low gear which helped keep my heart rate down and my respiration to a minimum. To be honest, I didn’t even feel too much of a burn in my quads like I had expected. The bike itself was geared in such a way that I didn’t have any spinout on the back tire, even when I had to stand up and really muscle down on the pedals. When other people on the ride were fiddling with gears in the sharp transitions, all I had to do was simply stand up which made the ride simple and refreshing. This bike was also very lightweight and easy to maneuver. Bike Carson: How was the overall experience? Do you think you’ll end up getting one? I think that after I have a little more cash on hand I will definitely look into purchasing a single speed to have around for those days that you want to change up the routine a bit. Bike Carson: Another soul saved! Hallelujah! Praise to the Single Speed. Welcome to the Dark Side Brotha…may all your climbs be a grind and all your descents be da bomb! The SS Ride is the only True Ride! Brotha’s and Sista’s…Can I get an AMEN??? This is more my style…towering over the souls of geared rides. I keep thinking about the title of this post. “Pushing Single Speeds”. There are a few hills I can’t make, but I don’t find myself pushing that often. Still, it’s nice to have a nice light bike to push when the time comes! 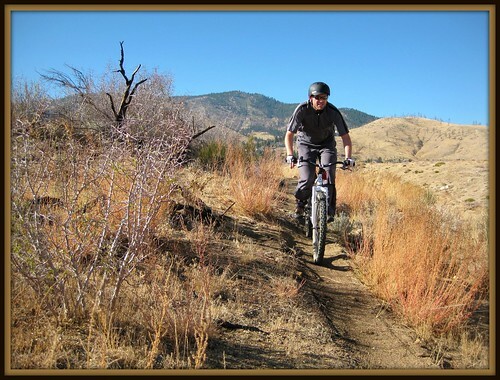 I love the ss….just not out in ash canyon so I converted to a rigid 1 x 9 and I’m having a blast. But I’ll still give a loud AMEN to those strong enough to pedal 1 gear around here because it sho nuff ain’t me. You’re plenty strong, as you demonstrated on the climb today. You just need to find the right gear. A couple teeth on a cog can make all the difference. Bro that Van is PIMP! I would give up the peddle commute for sure if that was my ride…and I would never ride alone! That would definitely be my choice of vehicle were I to travel around solving paranormal mysteries with a group of meddling kids. I got the bug after trying out a ride partner’s SS…I’ve got my eyes peeled for the right one. If your looking for cool custom vans, this is your hook-up! “If your looking for cool custom vans, this is your hook-up!